This project features another new AI release featuring an Elf sitting on a Mushroom. With tiny elf like features, he sits high up on a mushroom. You will learn how to alter the mushroom giving it more interest. 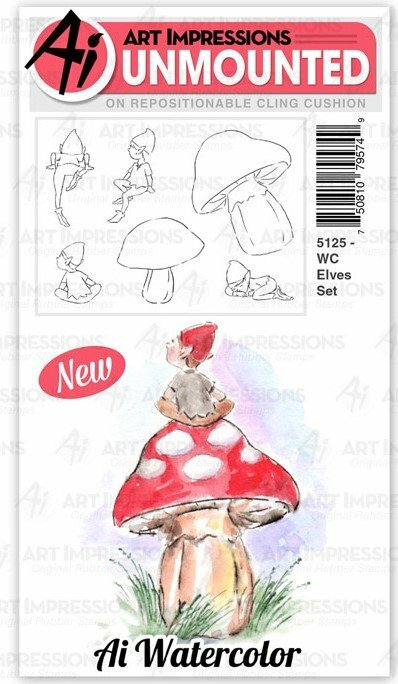 As usual, this set comes with a variety of elves and mushrooms. **As a part of the class fee, each student will receive the elf stamp set. Please bring: size 1 & 4 brushes, cup for water, palette, stamp positioner, acrylic blocks of various sizes, adhesive to assemble card, (5126) foliage set 4; (5007) foliage set 3. You will also need the following Tombow pens: 158/Dark Olive, 528/Navy Blue, 850/Flesh, 885/Warm Red, 947/Burnt Sienna, 177/Dark Jade, 969/Chocolate, 992/Sand and 993/Chrome Orange.